This article has been tagged as Needing work due to its lack of references and clarity on what production material is lost. 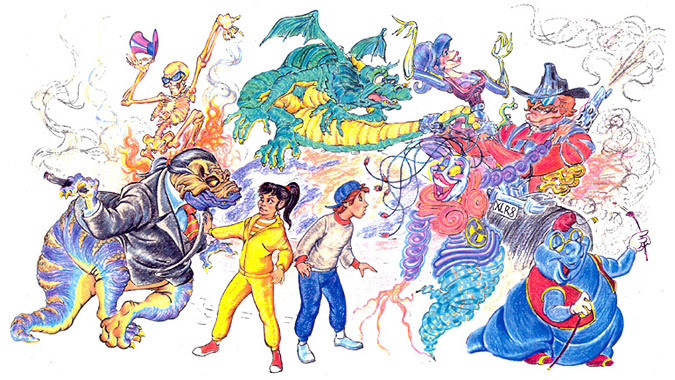 Drawing created by Ken Cope in 1991 depicting the characters in The Magic 7. 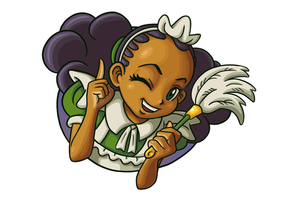 The Magic 7 is a lost, presumably unfinished, animated children's TV movie written and directed by Roger Holzberg. It is about the adventures of two children that battle the arch-enemies of planet Earth. The film was intended to be released on April 22nd back in 1997 but was postponed. Later in 2005, plans were made to release the film, only to have the film postponed again. The film started its production back in 1990, from which it has been delayed several times since. This was around the time that John Candy and Madeline Kahn, alongside the other actors (e.g. James Earl Jones, Michael J. Fox...), were starting the voice acting sessions for the film. However, John Candy died in 1994 and Madeline Kahn also passed away in 1999. Candy was to perform as the character of "Smokestack Sam" and Kahn was to play "Wastra". After their deaths, the audio recordings of their performance and their casting were removed from the film permanently. The year after Candy's death, a company that goes by the name of Pulse Entertainment and Distribution, under the supervision of their Chief Executive Officer, decided to buy the rights of the film and subsequently made the decision to fully produce the animated film; they then hired a songwriter named Robert J. Sherman to create extra songs for the film. The project reached a halt due to insufficient funds and the film project was cancelled in the early 2000s. According to Google and IMDb, the film was eventually released in late 2008 or early 2009 but this is highly unlikely; if it was the case, some footage from the film would have turned up by now. To this day, no footage or stills from the film has ever seen the light of day and it is likely that all we will ever see of the film is concept art.